Every member of SCVSAR is an unpaid volunteer. Our volunteers serve in one of five primary units: Alderwood, Snohomish, Marysville, Everett Mountain Rescue, and Operations Support. Some of our volunteers also are part of specialized teams that include: Helicopter Rescue, K9, Man Trackers, Mountain Bike, Project Care Track, Swift Water, Equestrian, 4X4, and Peer–to–peer/Family Support. “That Others May Live” isn't just a flashy tagline; it’s a way of life for our volunteers. Not everyone can put in the time required to become a Search & Rescue Volunteer, but they can still help! Our volunteers drop everything that they are doing at a moments notice to help others in need, or in the worst case, to bring closure to a family by recovering the body of their departed loved one. Someday, the mission could very well be for you or for someone that you love. Please consider making a donation in support of this incredibly valuable service. Your tax-deductible contribution can be made via the donate button below or check made out to SCVSAR at 5506 Machias Road Snohomish, WA 98290. Double the impact of your donation! Many companies offer matching gift programs to encourage employees to contribute to charitable organizations. Some provide matching funds to support employee volunteer hours. Most of these programs match contributions dollar for dollar, and some will even double or triple the amount of your gift! Check with your human resources department to find out if your employer offers a gift match program. Make a gift that will live on. Provide for SCVSAR in your will and estate plan. Contact us for further information on planned giving. Purchase books and goods through our Amazon Smile site, and we receive .5% on eligible items. Type in Snohomish County Volunteer Search and Rescue to donate to our organization without costing you more money. Contact us today for more information on SCVSAR and ways to donate. 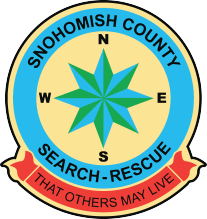 As an IRS 501(c)3 non-profit and Washington Secretary of State registered charity organization (http://www.sos.wa.gov/charities/ or 360.725.0378), all donations to Snohomish County Volunteer Search and Rescue (SCVSAR) are tax deductible. We never charge for rescue services. We count on the support and generosity. It’s people like you who continue our vital work, helping people in distress throughout Snohomish County and Washington State.